KWizCom’s List Aggregator app is a SharePoint client-side web part, utilizing the new SharePoint Framework (SPFx), enabling users to aggregate data from various data sources and display the aggregated data using a great-looking “Lego” style controls. 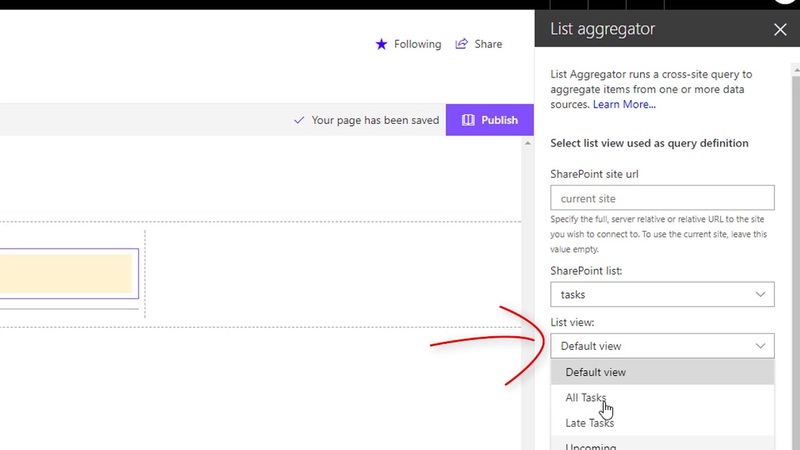 The List Aggregator app allows you to connect it to multiple aggregation sources, each can have a different dynamic scope, enabling you to dynamically aggregate items from specific lists, sites & sub-sites and entire site-collection. This way you can easily create a dynamic query that retrieves only the relevant items and documents from various sites in your SharePoint online tenant. Using the MS Graph API data source, you can easily aggregate data from any MS Online resource! Easily highlight your data with icons and fore/back colors, according to various logic conditions. The entire end-user interface is composed of controls that you can add/remove to assemble the exact UI you want! You can configure how your data will be displayed, what buttons and menus will be available, so you can have a custom aggregated view that matches your exact requirements! Out-of-the-box SharePoint list views are limited to a single SharePoint list, while Collaboration sites, Dashboards, Enterprise Project Management sites & many others require the ability to aggregate data from multiple sources, and display it in convenient way for end-user to work with it. The List Aggregator client-side web part is part of the KWizCom Data View Tools package for SharePoint Server/Online. Deploy the kwizcom-data-view-tools to app catalog. Go to your site’s App Catalog. Upload or drag and drop the kwizcom-data-view-tools.sppkg to the App Catalog. This will deploy the client-side solution package. Since this is a full trust client-side solution, SharePoint will display a dialog and ask you to trust the client-side solution to deploy. Go to your site collection. Choose the gears icon on the top nav bar on the right and choose “Add an app” to go to your Apps page. Click “From your organization” link in the left side of the page and select the “KWizCom Data View Tools” app and install it on the site.